For many years now, World Archery has awarded “Star” pins for achieving certain scores in the 1440 Round (formerly the FITA Round). These recognize that certain scoring thresholds are significant achievements in archery. Several of our members can be seen proudly sporting their 1000 point pins. Star Pins can be earned at any Star FITA sanctioned 1440 event for score thresholds of 1000, 1100, 1200, 1300, 1350, and 1400 points. (Star Pins are only earned for the Cadet, Junior, Senior, and Master distances only, so younger archers would need to compete up in those cases). — including indoor 18m and 25m rounds. In World Archery Rule Book 2 section 6.3, there is a table listing the necessary scores for various “Target Awards”. Any scores over 500 points on these rounds qualify for one of these “Target Awards”. These pins must be requested through USA Archery. WA 720 Round (“70m” or “50m Compound Round”). For cadets and masters, these scores for their 60m distance will result in a “Silver Target Award”. USAA – FITA Stars (link updated Feb 7th, 2018). Make sure to write “World Archery Target Award Badges” on the form, since there is no current listing on that form for them. Also make sure to write down the name of the round you shot (“18m Round”, or “25m Round”). The cost is the same $15.00 per pin. You will also need to submit a copy of your scorecard signed by a tournament official/judge. If you would like to submit your score for WA pins, send Tony an email, and we’ll track down an official to sign and email you your scorecard. (This is a great use of the electronic scoring scorecards). These awards are available with the same requirements as the Performance Awards (FITA Stars) — The event must be on the WA calendar (In the US, that is “Star FITA” sanctioned, but double-check that your event made it onto the WA calendar). Archers must be a member of USA Archery on the day of the event (NFAA reciprocal memberships won’t count for this). Pins can only be awarded for the first time you achieve a score for a given format. For Illinois’ winter tournaments, the State Indoor 18m and 25m both qualify, as does the JOAD State indoor so you could request up to three pins, depending on your scores and your history of earning these pins. Archery Canada has photos of all of the Performance Awards, Target Awards, and Arrowhead Awards (for field!) on their site. Thanks, Canada! So keep an eye on the sanctioning levels of upcoming events. US Indoor Nationals is definitely sanctioned at the World Archery level, so scores shot there will qualify. The ITAA State Championships, both the indoor 600 Rounds and the Outdoor 900 Round (or Outdoor 720 Round) are planned to be sanctioned sufficiently to quality for Target Award pins. I anticipate several 1440 Round tournaments this summer, and I encourage the event organizers to sanction those, as well. NOTE: The indoor 18m Round is only recognized by World Archery when shot with a 40 cm target face. So scores shot in JOAD events for Barebow/Recurve Bowman/Cub archers using the 60 cm target face will not be eligible. 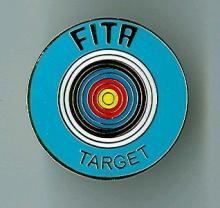 If a WA pin is critical for that event, you may “shoot up” into the cadet age class on a 40 cm target face.